Multituberculates are the only major branch of mammals to have become completely extinct, and have no living descendants. Although not known to many people, they have a 100 million-year fossil history, the longest of any mammalian lineage. These rodent-like mammals were distributed throughout the world, but seem to have eventually been outcompeted by true rodents. Meniscoessus robustus. Photo by Anne Weil, © University of California Museum of Paleontology. Multituberculates first appeared in the Late Jurassic, and went extinct in the early Oligocene, with the appearance of true rodents. Over 200 species are known, some as small as the tiniest of mice, the largest the size of beavers. Some, such as Lambdopsalis from China, lived in burrows like prairie dogs, while others, such as the North American Ptilodus, climbed trees as squirrels do today. The narrow shape of their pelvis suggests that, like marsupials, multituberculates gave birth to tiny, undeveloped pups that were dependent on their mother for a long time before they matured. 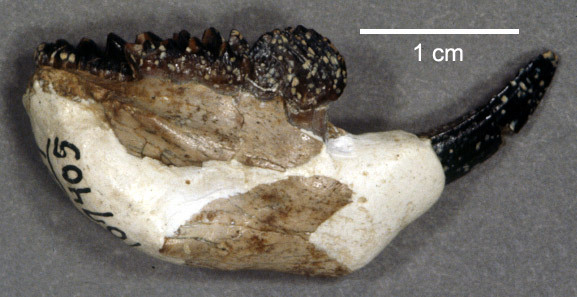 Pictured is the reconstructed lower jaw of Meniscoessus robustus, a squirrel-sized multituberculate from the Upper Cretaceous. This specimen was collected from the Hell Creek Formation of Montana, USA, and is now part of the UCMP collection. Multituberculates get their name from their teeth, which have many cusps, or tubercles arranged in rows. Although there are some spectacular multituberculate specimens from Mongolia, many of these unique teeth have been found in North America, and UCMP houses a large collection.